Myrddin was launched in January 2014. Built with the tried and true method of BS1088 gaboon plywood and West System epoxy . This vessel comes in at an unloaded weight of 6.5 ton. A lot of thought has gone into the lay out of Myrddin which make for a very roomy and comfortable interior. Owners cabin Fwd in the port hull with ensuit . 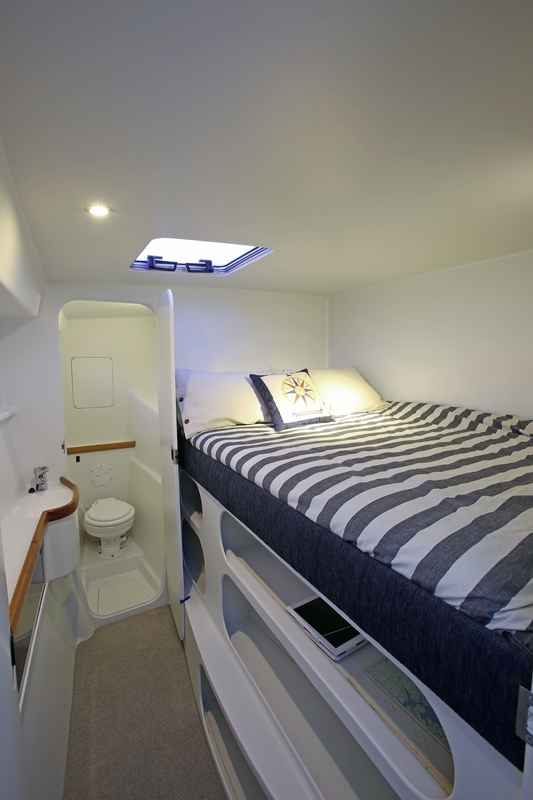 Double cabin with an extra single bunk in the Stb hull. Aft in the Stb hull has a generous toilet and shower area. Aft in the port hull is a very roomy single cabin with lots of storage. Aft in the Saloon is the galley with slide out storage a fridge and Freezer opposite. The saloon door and window opens up into a large cockpit with seating on both sides of the boat. The large saloon door bi-folds and tucks in behind the fly-bridge ladder which unclips and folds out of the way. Access to the engine rooms are through the seats and there are large storage lockers in the coamings aft of the seats. The Aft beam has more storage for gas bottles and BBQ with a sink and pull out shower tap built in. Removable davits are located on the transom to hold the dingy. From the cockpit steps go down onto large swim platforms on the transom which make getting on and off the boat a breeze. Myrddin has a large fly-bridge area with upper helm. Keeping the helm simple and clear with an I-pad hooked up by blue tooth to the electronics at the lower helm screens can be displayed and the stereo can be controlled. Wrap around seating gives give plenty of space for people to stretch out in comfort while giving enough space to house the dingy behind the helm for long voyages or rough seas. drive gear boxes and 17" Props. This give the boat a top speed of 22 knots and cruises at 16 knots. The engines are controlled by electronic throttles.Myrddin ticks all the boxes for space comfort and economy.